Don't miss out. There's only 4 available and 17 other people have this in their cart right now. Don't miss out. There's only 1 available, and 17 other people have this in their cart right now. 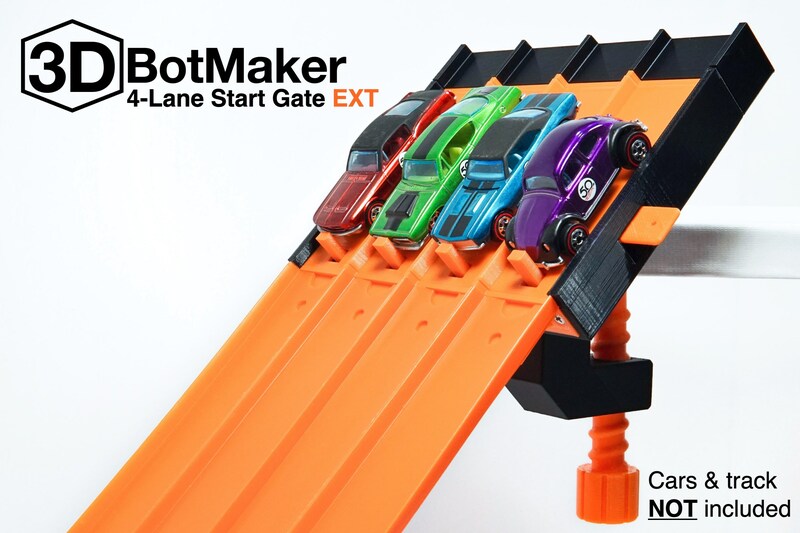 Introducing the new and improved 3DBotMaker 4-Lane Start Gate. The 4-Lane Start Gate EXT features a longer start platform and rear track tabs that allow you to race extra long vehicles or multiple cars per lane. Expand the possibilities of what you can race with the 3DBotMaker 4-Lane Start Gate EXT. -Quick release magnetic drop gate for a quick & fair start every time. - Extra long start platform can fit vehicles 112mm long. - Rear track extension tabs allow you to add track to the back of the start gate to race longer trucks or multiple cars per lane. - 2 ways to mount. Table clamp & screw mounting bracket. -Item designed for indoor play. Not recommended for use in direct sunlight. Another buy and a great Quality product.